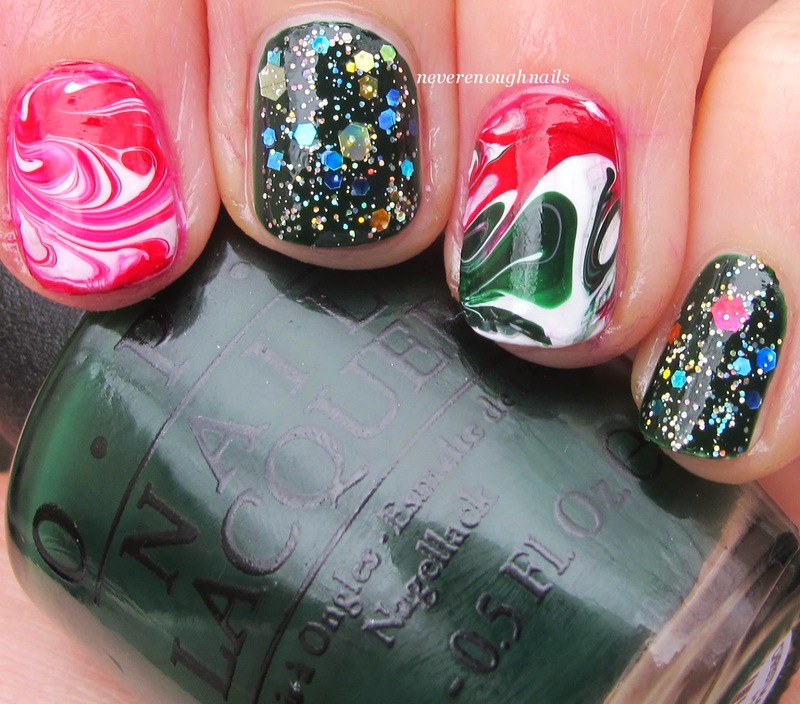 Never Enough Nails: Christmas Decal Marble and Glitter too!! 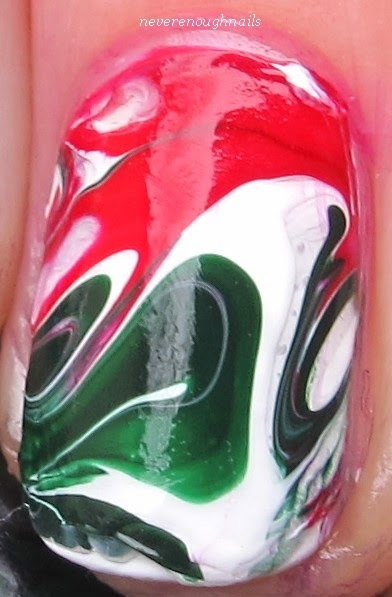 At this point, I am realizing that I only have a short time left to do Christmas manis. But I still have a long list of Christmas polishes I want to wear!! So I keep doing manis with accent nails and basically throwing as much stuff into each mani as possible. I'm not really going for a sophisticated look right now LOL. For this look, I used two coats of OPI Christmas Gone Plaid with one coat of Lynnderella Season's Glitterings for six nails. Season's Glitterings looks absolutely perfect over the deep dark forest green of Christmas Gone Plaid. For the two accent nails on each hand, I made marbled decals using the technique I described in this post. I used OPI Cinnamon Sweet for the red, OPI Angel with a Leadfoot for the white and OPI Christmas Gone Plaid for the green. I think I would recommend using a different red if you try this. Cinnamon Sweet stained my cuticles and I could not get it to clean up properly. There are plenty of other red choices around though! This was a fun look to do and to wear. I got a lot of compliments on it when I was out doing my shopping yesterday. 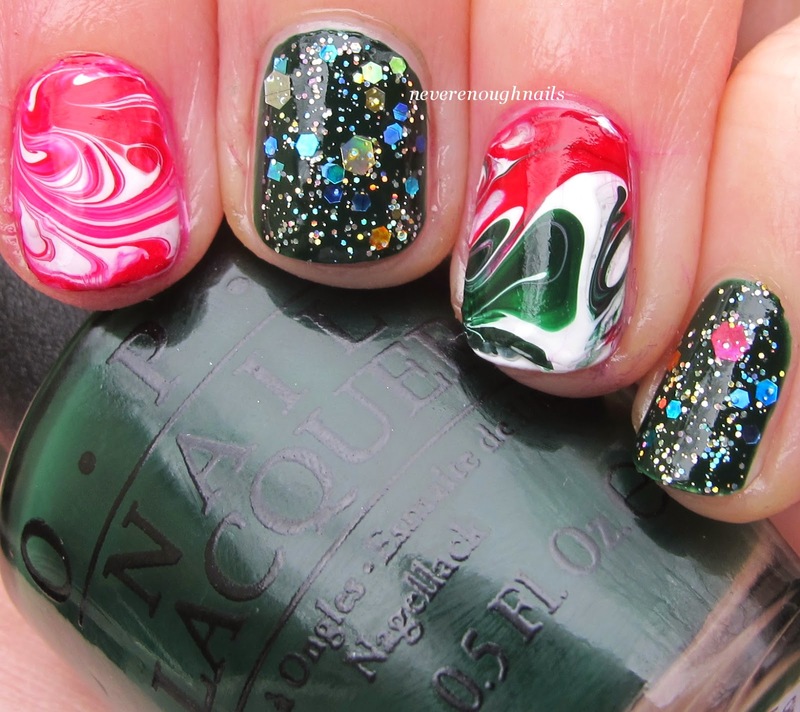 But now, I must move on to the next crazy Christmas mani while I still have time! I also need to finish my shopping and make Christmas cookies!!! Thanks Ananka! It was fun to wear!